So by now, I’m sure you have taken stock of your spending by using my suggestion of daily spending lists (or an electronic equivalent) so you realize what you spend on a daily basis. Good for you! I’m also sure that since reading my first budgeting basics post, you have been waiting with bated breath for me to suggest the next step on the road to a successful budget. Well wait no more! Basics of budgeting comes down to developing smart habits, knowing limits and making a plan you can stick to and adjust for any situation. I am all about the baby steps. In fact, I still have yet to make a completely successful budget for our household. That means that I am learning plenty as I go, which (in my opinion) is a good thing. 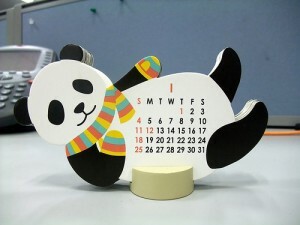 Just cause my sis loves pandas! Gather up all of your monthly bills. Since you already know what you are spending daily, the monthly expenses should come easily. After all, you do pay these bills every four weeks, right? All of us have normal monthly living expenses. Mortgage or rent and utilities are nearly unavoidable, so those are obvious. Insurance is a must for most of us. If you have a car payment, include it. Paying on your credit card every month? Don’t leave that out! Have cable? You should probably throw that one in there too. Leave no stone unturned in this compilation and (like your daily spending list), take a long look at it. In addition to your monthly expenses, you will have to rake through your foggy memory and dig through that desk drawer full of receipts in search of your semi-annual expenses. This will definitely be more of a task than the daily or monthly expense tracking, as these purchases are often scattered randomly throughout the year. If you pay your car insurance in full, do not forget, as this may be one of the bigger of these expenses. In addition, you will be looking for car repair bills, car registration, Federal/State/Local taxes, Travel, Education, Holidays/Celebrations, Subscriptions/Memberships and many other bills or expenses that arise. If you can not recall all of these purchases or do not save receipts, get older bank statements and look them over. (You probably did not pay cash for most of these expenses). There is still a lot of work to be done to complete a budget, so do not think you are out of the woods yet…in fact, we are just getting our feet wet. If you are playing along at home, so far all we have really done is get our expenses in order. This is a big first step to budgeting, but it is only the beginning. Over the next few months, I will give you all the tools you need to complete a successful budget that you will be able to work with for years to come. Please feel free to comment and share your successes, I am always happy to hear them! Good post here. I often forget about annual or semi annual expenses. Thanks for the reminder! Previous post: Live Like a Rock Star? I’ll Pass.